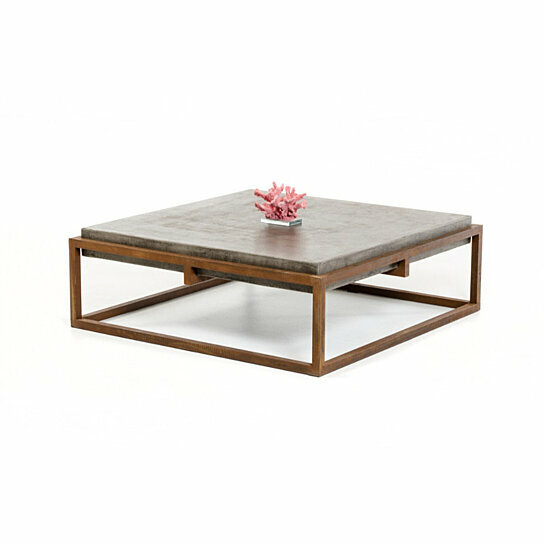 Designed with industrial aesthetics in mind, this Coffee Table brings streamlined design to your living room space. Made from rustic finish steel, the base of this table boasts a brown finish and features an openwork design for an airy feel. Up top, the square tabletop Made from fiber reinforced concrete sports a gray finish for a look that complements nearly any color palette. Set this coffee table at center of your living room to create a striking look and provide you with a spot to hold your drink, books or decors. The frame of the table features an openwork design for an airy feel. The frame of the table is made from rustic steel and top is made from fiber reinforced concrete. Care Instructions: Wipe With Mild Soap to preserve its charm.